The giant technology manufacturer Intel will soon end its support for one of the world’s best-known competitions that showcases the math and science talent of super-elite U.S. students. The decision by the Silicon Valley corporation, first reported by the New York Times, will no doubt come as a stunner for the community of parents, scientists, phenoms, and fans of the event who have followed the Science Talent Search over the years. Intel officials did not offer an elaborate explanation of their decision. Company spokeswoman Gail Dundas noted in an interview with Education Week that Intel’s contract to sponsor the competition will end in 2017, after two decades. She noted that the relationship has been a “long-term corporate sponsorship,” declining further comment on Intel’s rationale. The Intel Science Talent Search, as it is currently known, describes itself as the nation’s “oldest and most prestigious pre-college science competition.” The event seeks to pay tribute to high school seniors who conduct ambitious scientific research, and inspire them to become future leaders in science-related fields. Out of a pool of roughly 1,800 American high school students who enter the competition, the yearly applicant pool is pared down to 300 semi-finalists, who receive cash prizes, along with their schools, From there, 40 candidates are invited to Washington, D.C., as finalists; eventually first-, second-, and third-place winners are chosen in three categories: for the Basic Research Medal, which honors depth of research and analysis; the Global Good Medal, which focuses on demonstration of solutions to real-world problems; and the Innovation Medal, which recognizes problem-solving through innovative design and creativity. About $1.6 million in prizes were given out during the most recent year. This year’s first-place winners were Noah Golowich, 17, of Lexington, Mass., who developed a mathematical proof that could have implications for theoretical computer science, biology, and game theory; Andrew Jin, 17, of San Jose, Calif., who fashioned a machine-learning algorithm to identify adaptive mutations to the human genome; and Michael Hofmann Winer, 18, of North Bethesda, Md., whose research on how quasi-particles of sound interact with electrons has potential implications for complex atomic structures, like superconductors. Before Intel, perhaps best known as a semiconductor manufacturer, began sponsoring the competition in 1998, the talent contest was backed by Westinghouse, a major manufacturer and energy company. The Science Talent Search has long been viewed as something of a barometer of super-elite talent in U.S. schools, and a harbinger of the interests of elite students likely to be entering science-related fields. Several years ago, an analysis of the Intel competition and two other high-profile STEM competitions found that the children of immigrants to the U.S. dominated those events—taking 65 percent of the finalist positions in the three competitions. It remains to be seen which corporation might take up the sponsorship of the talent competition, with Intel’s departure from the stage. “They have been an excellent partner for almost 20 years, but their corporate priorities have changed,” Maya Ajmera, the president of the nonprofit Society for Science & the Public, the organization that administers the competition, told the Times. She said her organization will soon begin looking for a new partner. 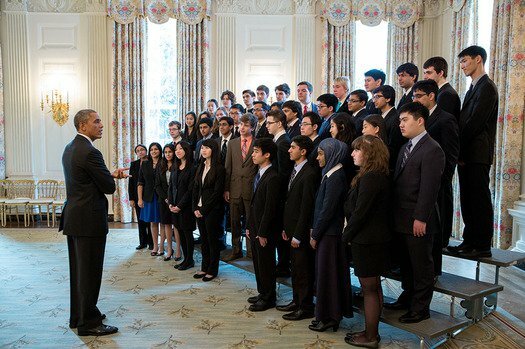 Photo: President Obama greets the finalists in the 2014 Science Talent Search. Photo courtesy of the White House.